Theresa May has written to European Council President Donald Tusk to formally request a delay to Brexit beyond 29 March. The prime minister told MPs she was “not prepared to delay Brexit any further than the 30 June”. 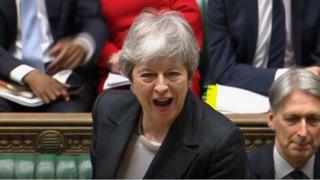 During a fractious PMQs, she said MPs had “indulged themselves on Europe for too long” and she wanted to avoid the UK taking part in European elections. The SNP’s Pete Wishart accused her of “caving in to Brexiteers”. However, she goes on, “it remains my intention to bring the deal back to the House”. But if the motion is passed, more time will be needed for Parliament to ratify the deal, she says, so she would like to request an extension to Article 50, the legal process taking the UK out of the EU, until 30 June. There is no mention in the letter of a longer delay, as some had been expecting. Mrs May heads to a European Council summit in Brussels on Thursday to discuss delay options with the leaders of EU states – all 27 of them must agree to a delay before it can happen. A European Commission spokesman said its president Jean-Claude Juncker had received a phone call from Mrs May about Article 50, informing him of the “latest state of play” and how best to approach the European Council. The spokesman added “nearly all foreseen contingency measures are approved” for a “no-deal” scenario, with only two outstanding, which are short-term visas and the EU budget for 2019. ← Killing Eve star Jodie Comer talks about the new series and why she loves Villanelle.